I only made it one episode into the new The Handmaid’s Tale adaptation. The first time I read the book, I was sixteen and new to Margaret Atwood. My English teacher at the time had given me a special reading list to cover over the summer, and young, privileged, and still relatively far from my feminist and political awakenings, I was able to read the book as a satirical dystopia. The 80s were far behind us, fundamentalism was something we read about with caution but didn’t really fear for our country, and the future consequently still promised to be secure and bright. I had a Republican father, and in Bush’s America, I didn’t feel threatened. America was the land of the free, and nothing could change that. 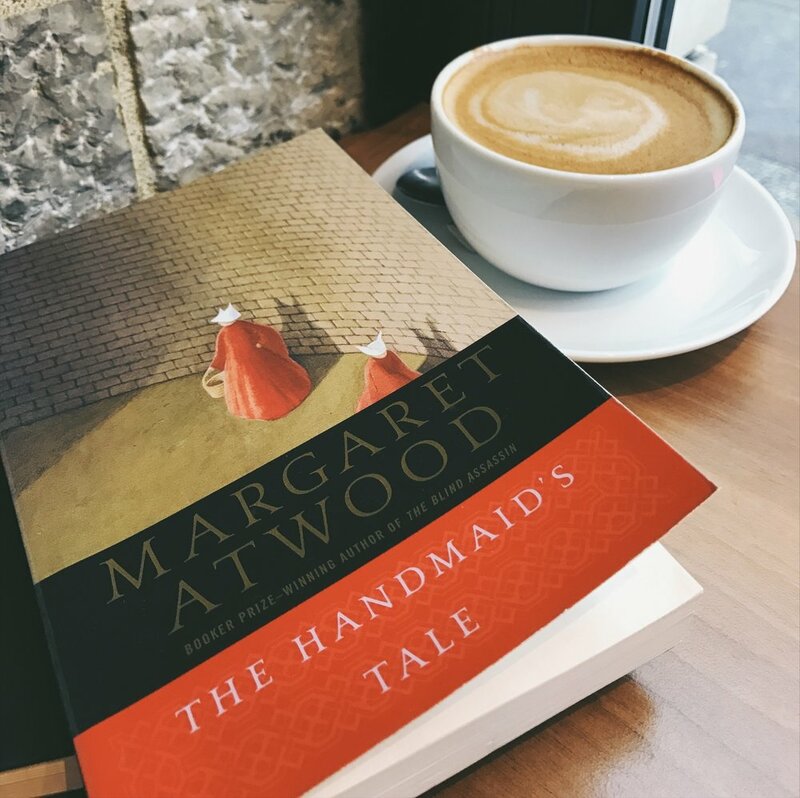 Atwood’s words on the page were horrifying but so far from possible that The Handmaid’s Tale was still just a story. After all, it’s as Offred says in the novel, “If it's only a story, it becomes less frightening.” Ten years went by. Wars kept on, mass shootings became regular occurrences, terrorism became even more of an ever-present threat, and then America decided it would rather elect a racist dictator-in-training rather than elect an extremely-qualified woman. Planned Parenthood came under attack, pregnancy and c-sections became pre-existing conditions ready to be used against providing healthcare to women, and millennial men declared they wanted their wives to stay at home. For all our progress, the country leapt not just decades into the past, but it did so diagonally, into an even more extreme alternative. Margaret Atwood’s satirical imaginings are no longer just fiction, they’ve become an uncomfortable warning. Misogyny is digging its claws deeper into society. Women, at least, are aware of this. Photos of women dressed as Handmaids flooded the internet during the Women’s Marches in January. The celebrated women’s club, The Wing read it as part of their book club, “Nolite te bastardes carborundorum” gained renewed relevance, and Hulu decided to adapt The Handmaid’s Tale. SNL picked up on the popularity and spoofed it this week in a clip that highlights not only the phenomena of the Handmaid, but men’s total oblivion to radical changes that do not affect them. If your Twitter and Instagram feeds are anything like mine, you’re all aware of this, especially now that Hulu has released the first four episodes of its adaptation. Everyone is watching it; everyone is talking about it; and everyone is traumatized. I reread the book in preparation to watch this week, and still, I only made it an episode into the series. I consume a lot of disturbing fiction. I’ve read extensively on eating disorders, death, and all the joy you come across in feminist literature. I’m long past the blissful ignorance of my teens, and I like to be aware of things, no matter how uncomfortable they may be (as long as I then get to balance it out with cake and really fluffy books or shows immediately afterwards). It’s important for us to know about the different realities of the world. It helps us become more empathetic, and in this age of encroaching fascism, that empathy is the strongest form of sustenance for resistance. A lack of it leads to complacency, and complacency to enabling. The Handmaid’s Tale is an excellent key to thinking about the radical changes that have come about in the last few months. Yes, it’s still dystopian fiction, but it’s no longer unimaginable when the U.S. is led by what is essentially a boy’s club and the Vice President of the country is afraid to sit down to dinner with any woman who isn’t his wife. Women are slowly yet importantly being pushed back at every level. It’s easy to believe that an administration that clearly doesn’t respect women could decide that women are only good for reproduction. It’s already planting those seeds with everything that it does, so it’s no wonder that women around the world are suffering while they watch The Handmaid’s Tale. Having read the book earlier this week as well, my boyfriend commented on how the least believable thing about the story is the rapidity with which Gilead is formed and its way imposed on all of American society. That probably is one of the things that creates a sense of distance in the story, but I personally think that it’s the most terrifying thing both in the novel and series. Maybe not to that level of extremity, but deeply hurtful and alarming changes can be made with almost instant effect, and that knowledge is overwhelming. Look at the first few weeks of Trump’s presidency. The most comforting thing with reading The Handmaid’s Tale is the distance from the storyline. The book still feels very 1980s and knowing that it wasn’t written about our current society is reassuring. That comfort totally goes away with the television series. Every reference is updated to fit with contemporary society. Tinder and Uber are name dropped in the first episode, and you no longer get the sense that this kind of thing could only happen in a pre-Internet society. Everything looms in the recent past, and reassuring distance is replaced with immediacy. The show wants us to know that this could happen. It’s a product of its time in a way that our generation can’t immediately feel with the novel. Sure it’s a dystopian satire, but it’s now more of a satire of the things that could technically happen. If we give up empathy. If we give into fascism and religious fundamentalism. If we keep ignoring global warming. And so everything in The Handmaid’s Tale becomes too much, becomes too violent. The extreme politics, the mass indoctrination, the way women are animalized, the way the earth turns against us, the way physical violence is normalized. Everything is over the top, extreme, the realization of every anxious, panicked, “what if this goes further?” thought that we have while watching the news. It feeds off our anxieties and it makes us believe that our worst fears are possible. It makes us watch things we care about disappear. It even makes us watch Rory Gilmore, the character who stood for so much for so many women of our generation, put into the role of a supposedly submissive Handmaid and forced to suffer unimaginable physical horror for resisting and showing free will. So is it any surprise that everyone who watches The Handmaid’s Tale seems to be traumatized in a way that isn’t real with other dystopias, other, violent horror films? It hurts to watch The Handmaid’s Tale because the world isn’t what it used to be, because it’s taken a superficially sudden turn in a very dangerous direction. That The Handmaid’s Tale is too much to watch is exactly the point.